I needed xtra space to store data. An xtra hard drive could also come in handy if I one of our laptops crash. This seller responded to my bid very quickly. 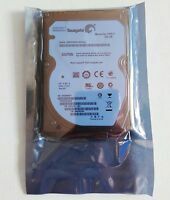 Drive was well- packed in a sealed anti-static envelope. The hard drive tests and works perfectly. If I need something else they are selling, I would not hesitate to buy from again. Nice update for older computers. These worked great when swapping out with older systems. Used them to replace regular 160 gb drives in some older hp dc7900's Since the motherboard only supports sata 2 these worked like a charm and did not need the more expensive sata 3 drives. Noticeable improvement in performance and a good cheap way to squeeze a few more years out of older gear. Excuse me, my SSD hard disk is good!I hope, buy again?I wonder if you could deliver the goods to me again?I will pay you again, OK?